Coworking’s greatest strength is collaboration. People don’t want to work in a vacuum, they want to interact with other people. They want to be inspired and encouraged. They do their best work when they have a support system and a culture of sharing and community. Ethical Collaboration greases the skids for interaction and community. Our educational programming emphasizes the community of collaboration, and the Agreement frees everyone from the nastiness of NDAs and secrecy. By using Ethical Collaboration as an onboarding tool for your new members, you set the tone for inclusiveness and harmony, and you set the expectations of mutual respect and mutual assistance in the community. As a coworking administrator, you also recognize the possible liability that might happen when community members quarrel and disagree. Ethical Collaboration Association handles many of these issues through mediation and arbitration so that you don’t have to. As a 501(c)3 non-profit, Ethical Collaboration is an unbiased party who can settle any disputes without bringing you into the mix. When people are in your facility, they know they can Speak With Ease. Five people from your organization can go through the Certification process for Group Organizers. This is so that the whole team understands IP issues and can spot problems that may pop up. ($199 value per person). 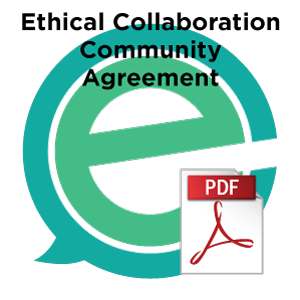 We will onboard all your current members by sending them through the Ethical Collaboration onboarding process, and they will sign the Ethical Collaboration Community Agreement. All your members will receive discounted pricing for Ethical Collaboration Certification, as well as discounted or free pricing for all IP.Education’s online courses. We will give you the tools to add Ethical Collaboration to your new member orientation/onboarding process. It is as simple as a link from your website. You will receive various membership collateral, such as credentials for your website, handouts, and stickers. You will also be able to order other promotional and giveaway items, such as t-shirts, banners, logos for your front door, etc.